Saturday was a big day for Tigers cross country. Cedar Falls placed four runners in the top 10 for both men and women, and the men brought home their first state championship in 35 years. The Tiger men finished first, 19 points ahead of Des Moines Roosevelt and 71 points ahead of previously No. 1-ranked Iowa City High. Men’s head coach Troy Becker has been preaching all year about how important it was to place two runner in the top 10, and on Saturday he was happy and proud to see three CF men finish in the top 10. “We pout three guys in the top 10, and after all year everyone telling us us that we didn’t have a top runner, getting three first team all-state runners is awesome,” Becker said. Tiger runners Brian Chenoweth, Steve Arntson and Dan Chenoweth finished eighth, ninth and 10th for the Tigers at the state meet. All three of them finished within four seconds of each other. Brian Chenoweth, the only senior among the three, was happy that he could end his high school running career the way he did. “I’m just happy to be a senior, and I could lead my team to a state championship,” Brian said. 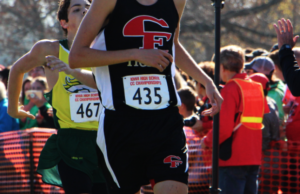 Dan Chenoweth, little brother to Brian, was the only sophomore to finish in the top 10, and he was a little surprised by hi outstanding performance. “I wasn’t expecting first team all-state, so I was really happy to get it,” Dan said. Other Tigers who scored were Cyrus Moussavi and Jason Mitchell who finished 31st and 33rd respectively. This was the first time that Moussavi has scored points for the Tiger varsity team all year, and until recently he was just the top runner on junior varsity. “He wasn’t even on the varsity three weeks ago, and he stepped up to be our fourth runner today. He just had a great race,” Becker said. Levi Forrester of Waterloo West finished fourth overall, just six seconds ahead of Brian. Nygren finished seventh at State last year, and she was in danger of finishing back there again. “I passed five people in the last half mile,” Nygren said. After leading the race for the first mile, Nygren fell back to eighth place, but after she hit the two mile mark, she held nothing back and just went for it. Surprisingly, it wasn’t her plan to lead the race early. “I didn’t really have a plan. We were just talking about going out strong in the first mile, and I happened to be out front,” Nygren said. When the Tigers stepped up on the deck in Fort Dodge, they were treated with screams of joy and happiness. “It was really neat because we had a huge crowd there. I have to thank the fans because they helped out by cheering really loud during the race,” Brian said.